4:45am. Friday. Pouring rain. Great way to start off the day. I had all my camera equipment and tech gear packed in my pelican case, along with various rain-coated camera bags. It’s just too bad my raincoats were in my car! Worst of all, I had to make two trips to bring all the gear to the car. Thankfully, I had a few extra shirts packed for this exact situation, but I was saving them for the track. I already had to break into the reserves! The beauty of driving early in the morning? Nothing. The sun wasn’t even up! But I will tell you the sunrise was something out of a fairytale. As I headed west, I could see it in my rear view – awe-inspiring to say the least. I was tempted to stop and take some pics, but I was already running late. I made it to Minus’s house, and we loaded up his truck. We were off in search of breakfast. Denny’s has really stepped up their pancake game. 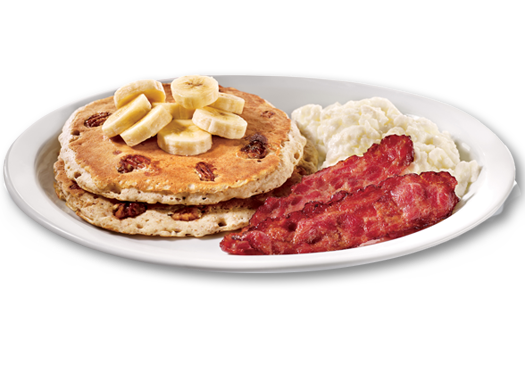 We highly suggest the Banana Pecan Pancake Breakfast. Straight baller. Media passes were available at 9am, so we hung out by the will call hut and made some new friends. We met Highway Star Doritos who drove all the way down from Melbourne. Cool dude. Sick S2000. Once we had our credentials, we headed off to the in-field entrance to find a parking spot. Luckily, we were so early not much was going on. We ran into Red of R&D Garage who was helping out Hateley Motorsports, the beautiful orange E30. We talked to the photographer for Hateley. Really cool dude with lots of great stories and info. Then we headed off to the media meeting, so we could get on to the action. Lucky for us, the media meeting was near the starting grid. We hurried over to it as we were already hearing sounds of roaring V8s and screeching tires. We were not disappointed. As the drivers were approaching the grid, they were given space to “warm up” their tires by way of high speed donuts/burnouts. Awesome. The best part about it all was our proximity to the action. The only thing in the way was the k-rail, and in some places, we didn’t even see it! I definitely found myself jumping out of the way a few times or moving cones for the drivers to exit. We stuck around for a bit. Maybe it was because we were awestruck by the near touchability of the action. I’ve been on drift ride alongs, but this was a whole new level of awesome. After a while, we took off to dump some photos. I shot close to 650 in the course of an hour. We slowly realized that we were going to have quite a bit of material to work with this weekend. I have to say, media access is quite an experience. We are so grateful to John over at the id agency for giving us a chance as official Formula D media. Thanks, John! We stopped for some food and then headed to the track to catch the practice runs. We ran up and down the grandstand sides looking for a good spot. We found some good ones as you can see here! We shot the rest of the practice runs and went back to the grid before deciding to take off as the Pro 2 runs started. We wanted to conserve our energy for Day 2. We had a feeling it was going to be a long one….